Suzuki teased an off-road concept ahead of its Tokyo Motor Show unveiling this month. And it looks like a postmodern twist on an old favorite. They are rare in the U.S. But go many places in the world where roads are more implied than paved and you’re sure to see the stalwart Suzuki Samurai. This ’80s-era off-roader lived up to its name—nimble, strong, and understated. While these vehicles still romp through distant jungles, the model was discontinued in America in 1995. But Suzuki previewed an all-electric concept SUV to debut later this month. The e-SURVIVOR model looks like a stout, light, and capable next-gen off-roader. While little is known, it appears to be a cybernetic upgrade to the classic warrior. According to the brand, “the e-SURVIVOR is a compact SUV of the next age.” Suzuki calls it a blend of the Vitara—think burly golf cart—and the Samurai. Specs state the e-SURVIVOR has a “lightweight body” built on a ladder-frame chassis. This is another nod to the Samurai, which out-competed tougher vehicles of its day by weighing far less. As the “e” preceding the SURVIVOR’s name implies, it’s electric. Suzuki said each wheel will have its own independent electric motor—true four-wheel drive. 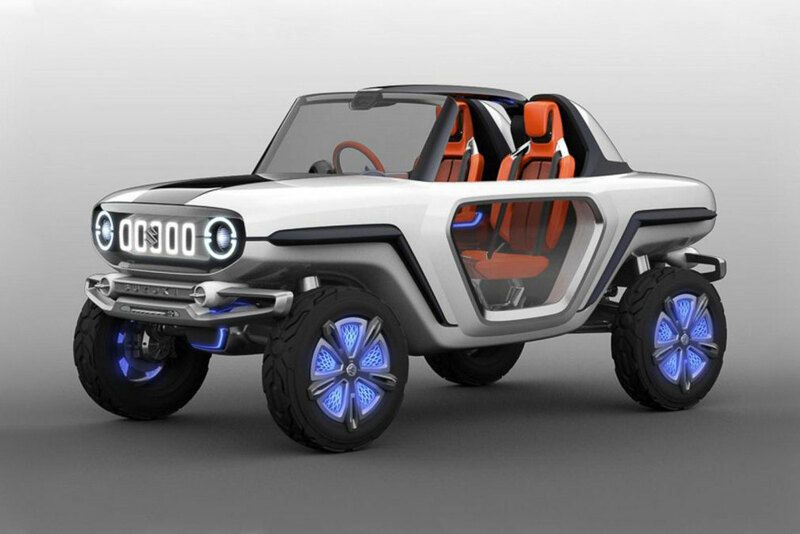 We also see the e-SURVIVOR has formidable ground clearance, a T-top, and see-through doors. A look inside reveals a driver’s seat more akin to an F-16 cockpit. A heads-up display shows news, navigation, and external cameras in place of side mirrors. In the center of the console (see above), it appears the driver has a three-dimensional holographic vehicle rendering, perhaps for diagnostics. And because some things just can’t be digitized, a step plate comes standard. There’s no word on potential price or availability. But it’s clear Suzuki knows it had a winner with the Samurai. If the brand decides to greenlight the e-SURVIVOR, we’ll be first in line.